Happy Thanksgiving everyone! My favorite holiday is upon us and I’m going to eat as much as I can without throwing up. I’ll try and avoid the meat sweats, though. Gotta keep it classy. Hope you have a great one! P.S. I totally get this article. I’m team Thanksgiving! 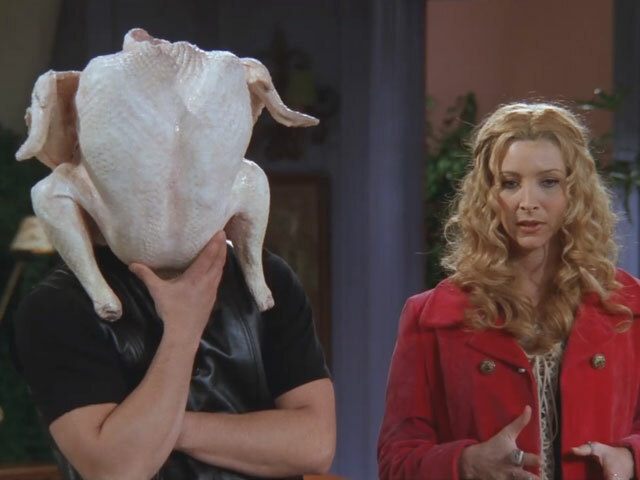 Image via here from this episode of Friends. it’s almost time for thanksgiving pants! It’s Tuesday. It’s two days until Thanksgiving. And I’m SO. EXCITED! I daresay that Thanksgiving is my favorite holiday of all time. Christmas is a close second, what with all the twinkly lights and the holiday cheer, but I find Thanksgiving to be a less stressful version of it. One filled with all the food and family and friends, but without the consumerism and stress of Christmas. Usually, my husband and I go to one of our family’ houses for Thanksgiving, but this year everyone will be out of town, so this is my first year cooking a Thanksgiving dinner. It will just be John and I with a few friends, but I could not be more excited (plus, that fact that we don’t have a dishwasher means less people = less time spent hand-washing dishes). I’m doing a ham instead of turkey (to ease myself into cooking this bonkers huge meal), with the classic sides. Fun fact: John is THE BEST mashed potato maker I’ve ever seen. My mom taught him long ago and now he’s my go-to tater guy. Love him. My favorite part is the stuffing. Honestly, is there anything more worthy of busting out your Thanksgiving Pants than gravy soaked bread? I think not. Here are a few of the recipes I will be making this year. Fingers crossed it comes out well!